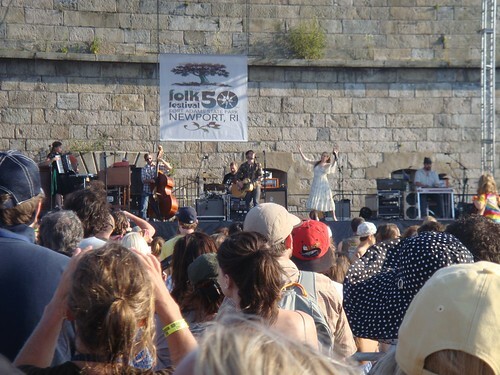 I spent Saturday at the 50th Newport Folk Festival, and it was excellent. Some of the highlights? Well, let's see... I saw Iron & Wine, The Decemberists, Fleet Foxes... the list goes on. Aside from a little bit of sunburn and a lighter wallet thanks to having my chair set up perilously close to the Del's stand, it was awesome. 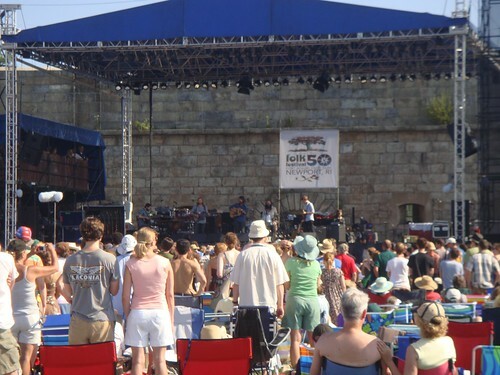 The festival was held at Fort Adams State Park in Newport, RI, and started at 11:30 in the morning. We even managed to get there for about 11:30, after waiting only about half an hour for a parking spot. 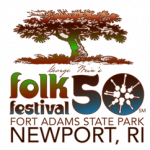 Right off the bat, the festival opened with a legendary name in folk: Ramblin' Jack Elliott. He was fun to listen to (lots of stories, obviously), although not quite as dynamic a musician as some of the others. Other early acts that I took in part of were Tift Meritt and Ben Kweller. Merritt didn't make much of an impression on me, but I rather liked Kweller. Around lunchtime, I watched Billy Bragg, about whom I have somewhat mixed feelings. He was very... politicized. On the one hand, I agree with him and his songs about why socialized medicine is good and deregulated banking is bad. On the other hand, even a rather staunch social liberal such as myself might want to listen to some music without the prosthelytizing that seems to be part of his music. I also saw a little bit of Tom Morello, who I won't even give a link to. He did not appeal to me. The big-name portion of the show started at 2:40 when Gillian Welch came on. Despite having a terrible, Flash-based website, she's actually a remarkably good performer. She had David Rawlings up with her (her usual accompanist), who is an extremely capable guitarist. At this point, I popped over to see Mavis Staples, but I went back to Gillian. It was just too damn hot for Gospel. Finally, at 4:00, we reached the trifecta that was my main reason for trekking up to Newport when Fleet Foxes took the stage. It took them about 15 minutes to tune and get the sound just so, but it was worth it. Few bands can sing those harmonies, and even fewer can do it live. I don't think I've ever heard pop music so orchestral aside from when I saw Brian Wilson and his band play SMiLE. 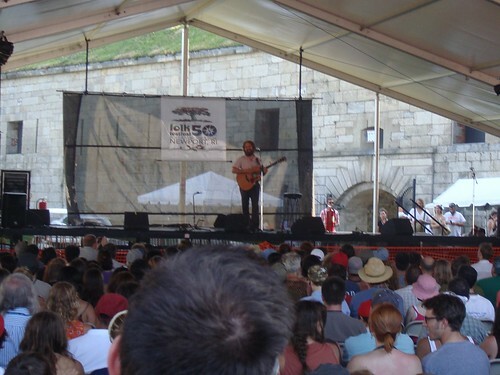 At about 4:45, I started heading over to the Harbor Stage, where Sam Beam (better known as Iron and Wine) was going to be playing at 4:55. I just barely managed to find some standing room in the shade (although not under the tent proper)... it was packed. And well worth it. His rendition of “Sodom, South Georgia” was amazing, and even more emotionally-charged live. Finally, at 5:30, I tore myself away from Mr. Beam and went back to the Fort Stage where I staked a claim on some good territory right next to the sound booth (after all, the sound there must be good because that's where they mix it all) for The Decemberists. The self-same Decemberists that I gushed on about a couple of months ago. They're in the midst of a tour for The Hazards of Love, but they did a mix of both Hazards, earlier, and new material. Upon seeing them live, my first impression was (and I'm sorry to admit this) “even normal-looking people can become famous”. No offense, but none of them are exactly movie stars... My second impression, however, was more along the lines of “ZOMG! I'M SEEING THE DECEMBERISTS LIVE!! !” Maybe with a few more exclamation points. Some highlights from their set include O Valencia!, Yankee Bayonet, Isn't It A Lovely Night, The Chimbley Sweep, and The Wanting Comes In Waves/Repaid. They also did a rather amusing "re-enactment" of Bob Dylan's going electric in 1965, featuring a squirrel as a main character. In addition to as much lavish praise as I can lay on Colin Meloy and the rest of the regular crew, I've got to hand it to Shara Worden and Becky Stark, both of whom sang on Hazards, and both of whom joined the Decemberists on stage. They're both fantastic singers, and helped to fill out all of that space at Fort Adams.